If your wireless network isn’t working properly with your NOOK Tablet, it may be a problem with the WiFi or it may be a problem with the NOOK Tablet’s connection to the WiFi signal. Is the WiFi router powered up and connected to the Internet? Does a laptop or desktop computer “see” and communicate with the adapter? Is the Internet service working? Check this from the computer. Turn off your NOOK Tablet and then turn it back on. Turn off the power to the router for ten seconds or so and then restore power. That may fix a problem that has cropped up in the internal memory of the router. Check with the network administrator to see if there’s a blacklist (of blocked devices) or a whitelist (of devices that are specifically allowed entrance) for the system if you’re trying to connect to a secured system (at an office or somewhere similar). 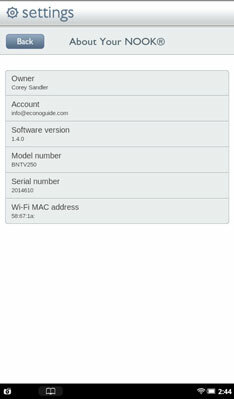 You may need to provide your NOOK Tablet’s MAC address (its unique identifier). To find your NOOK Tablet’s MAC address, go to Settings, tap Device Info, and tap About Your NOOK. There is your MAC address. If all else fails, call Customer Service at 1-800-843-2665. WiFi networks cover a relatively small area (about the size of a small house). It may take a bit of experimentation to determine the actual working area for the WiFi system you want to use. Tap the network to which you want to connect, and then tap the Forget command. This erases previous settings for the connection. Then tap the same WiFi network name and see if the second time is the charm. Go to Settings. In the Wireless section, look at the names of networks that the NOOK Tablet has discovered. Signal strength is shown to the right of each name: one to four stacked curves. Four curves means a strong signal. One curve means a weak signal, which may fade in and out. Most wireless networks use a security system to keep unwanted outsiders from using them. You usually need a key or password, and some also require a username. You have to enter the key exactly. If the key is 6sJ7yEllowbIRD, then that is how you must enter it. If your wireless system is at your home or office and you can’t make it work with all of your devices, it might make sense to reset the WiFi router to its factory default settings and reconfigure it with all of your devices ready to be connected. Consult the instruction manual for the WiFi system to learn how to do this. The NOOK Tablet doesn’t currently support voice-over-Internet services like Skype or Comwave, and Barnes & Noble has indicated it probably won’t go there; it wants to concentrate on things related to reading and writing.